January 14th, 2018, US Bank Stadium, Minneapolis, Minnesota. The season on the line, the jaws of defeat bearing down on the home team; the visitors having stormed back from a seventeen point deficit, now in the lead. Minnesota Vikings fans know the heartbreak, they having experienced it many times in their history, Blair Walsh’s missed field goal in 2016, the debacle in New Orleans in 2009, Gary Anderson’s missed field goal in 1998, and the Drew Pearson push-off in 1975, to name a few. The feeling of despair was resonating throughout the stadium, as the unlikely hero quarterback Case Keenum led the offense out on the field. Could he save the season or would the Vikings’ playoff curse continue. All they needed was a field goal, the problem was there was one timeout and twenty-five seconds. Fans were scared if the team could drive down the majority of the field. A catch of about fifteen yards in bounds did not ease the nervousness. No timeouts, 61 yards between Keenum and the Saints’ goal line. Ten seconds remained in the game, maybe enough time for two plays. Hope was all but gone. 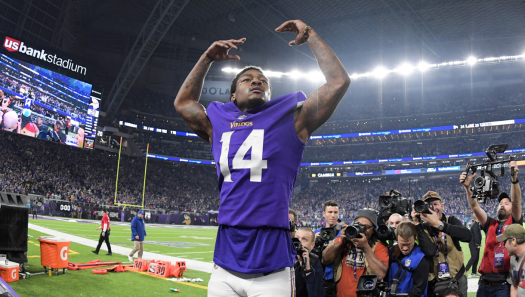 Then something remarkable happened, when the Vikings needed a miracle, they got one in the form of Stefon Diggs. A fifth round pick from Maryland who experienced a series of devastating injuries during his college tenure, who few believed would have a sustained NFL career. Now he is the star receiver for the Minnesota Vikings, that was the catalyst of the greatest moment in Vikings playoff history. Keenum dropped back to pass, the receivers ran the same routes they had used on the previous play, except about seven yards deeper. Keenum found Diggs at the New Orleans 30-yard line, which would have put the Vikings in manageable field goal territory if Diggs went out of bounds, instead it looked as though Marcus Williams (Safety for the Saints) would tackle in bounds, meaning the Vikings would not have enough time to get another play off and an imminent loss. Then the miracle happens, as Diggs came down with the ball, Williams missed. There was nothing between Diggs and a Vikings victory. As Diggs crossed the goal line pandemonium broke out throughout the “Land of 10,000 Lakes”. The curse has been broken.